Blogger Andy Ostroy, who bills himself as a “Political/Pop Culture Analyst. Blogger and Huffington Post contributor,” has spent much of the last several days regurgitating the same liberal hash in criticism of the tax bill as every other partisan left-winger. But, after the House of Representatives gave its final approval to the Tax Cuts and Jobs Act, Ostroy saw a photo of the Senate celebrating its passage of the act that featured African American Sen. Scott prominently in the photo. The left-winger probably didn’t expect Sen. Scott to actually see his tweet, much less respond to it, but Scott had an epic takedown of the HuffPo screedist, schooling him in why he might do better to obtain facts before blathering on Twitter. Despite being schooled by Sen. Scott, Ostroy kept digging his hole with a follow up tweet that consisted mostly of name calling and invective. 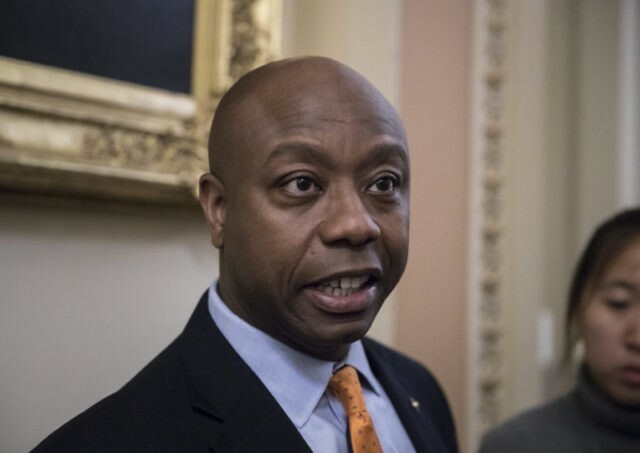 “Instead of worrying about me, perhaps @SenatorTimScott should be more concerned with his party’s shafting today of minorities, the poor & middle class…and of his shameless ongoing support of his sexist, admitted-sexual-abusing racist Machurian president who’s in bed w/ #Putin,” He blurted out. Ostroy has certainly inculcated the liberal tactic that when one cannot argue the facts, one resorts to calling people names.